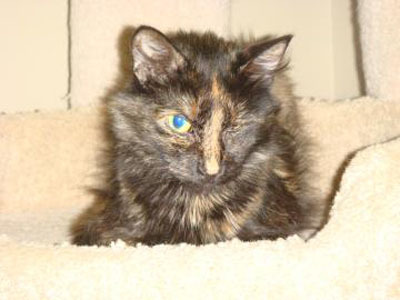 Honey Bee is a 5-year-old female tortoiseshell kitty. She was brought to Lollypop Farm with her 3 kittens due to allergies in her previous home. All of Honey Bee’s kittens have been adopted, so now it’s her turn to find a loving forever home. Something happened to Honey Bee’s left eye prior to arriving at Lollypop Farm. Unfortunately there is no treatment for her eye, but it doesn't seem to bother her. Honey Bee is a quiet girl who is a little shy when first meeting new people. It doesn't take her long to warm up and come over for some loving! She loves to be scratched around her ears and under her chin, and she will purr for you when you do that. If you are looking for a quiet, friendly kitty, Honey Bee is the one for you. Come out and meet Honey Bee…you won't be disappointed! Don’t forget that June is Adopt-a-Cat Month! Lollypop Farm is celebrating in a big way this year -- with Kittypalooza! Throughout June, cats aged one year and older can be adopted for just $35, while kittens younger than one year can be adopted for $35 off regular fees. Ouna, the dog from last week was adopted! 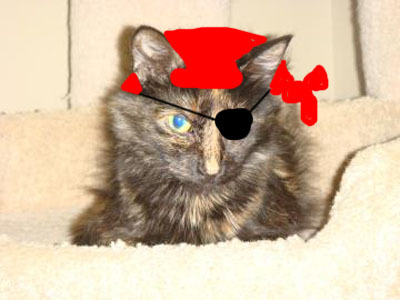 Bah ha ha ha ... does the pirate garb come with her if you adopt?